Perovskite-based solar cells are all the rage with researchers at Ecole Polytechnique Fédérale de Lausanne and UCLA this week detailing discoveries in this area. 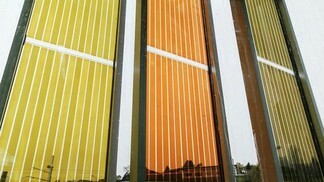 Paving the way to the design of photovoltaic converters with improved efficiency, researchers at Ecole Polytechnique Fédérale de Lausanne (EPFL) said they have uncovered the mechanism by which solar cells based on lead iodide perovskite light-absorbing semiconductor transfer electrons along their surface. Photovoltaic systems based on lead halide perovskite are a new type of device with efficiencies currently exceeding 16% but a detailed description of how these solar cells turn light into electrical current is still lacking. As such, scientists from EPFL have investigated how the generated electrical charge travels across the perovskite surface of solar cells built with various architectures. Lead halide perovskite materials have been attracting a lot of interest lately because solar cells based on these semiconductors demonstrate very high conversion efficiencies and an unsurpassed cell voltage of more than 1 volt, even though it is not entirely clear how they work. Understanding their functioning mechanisms would help improve them in the future or even open up novel technologies with increased efficiency, the researchers said. The team used time-resolved spectroscopy techniques to determine how charges move across perovskite surfaces. They worked on various cell architectures, using either semiconducting titanium dioxide or insulating aluminum trioxide films. Both porous films were impregnated with lead iodide perovskite (CH3NH3PbI3) and an organic “hole-transporting material,” which helps extracting positive charges following light absorption. The time-resolved techniques included ultrafast laser spectroscopy and microwave photoconductivity. They concluded that lead halide perovskites constitute unique semiconductor materials in solar cells, allowing ultrafast transfer of electrons and positive charges at two junctions simultaneously and transporting both types of charge carriers quite efficiently. In addition, their findings showed a clear advantage of the architecture based on titanium dioxide films and hole-transporting materials. UCLA engineers have invented a new process for manufacturing highly efficient perovskite photovoltaic materials that shows promise for low-cost industrial production. Perovskite solar cells are not made from the perovskite mineral itself, but they mimic its crystalline structure, which has proven to be particularly efficient for harvesting light to generate electricity. Advances in this area have enabled scientists to create perovskite crystals with different compositions that are suited to perform different functions whereby the UCLA team’s research focused on perovskite crystals made from a hybrid of inorganic and organic materials — methyl ammonium halide and lead halide, respectively — which are then made into a thin film that is sandwiched between two electrodes. The researchers said they’ve developed a way to produce solar cells using those materials more efficiently and cost-effectively than the current standard methods. 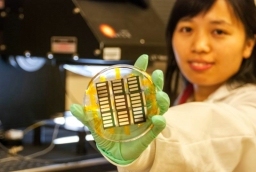 UCLA’s Huanping Zhou displays perovskite solar cells. Until now, engineers typically created the perovskite film using one of two processes: Either a solution of the organic and inorganic materials is used to create the film or the two components are thermally evaporated together inside a vacuum chamber. While each technique has been successful in research labs, both are challenging for large-scale industrial production. The wet process results in decreased film quality, and the vacuum process requires expensive equipment and uses a great deal of energy. The UCLA team’s new approach is a vapor-assisted solution process that efficiently produces perovskite solar cells without the flaws associated with the other techniques. In a few test runs, the technique produced solar cells with a power conversion rate of more than 12% — a rate comparable to or better than that of the amorphous silicon solar cell, the researchers said. They are now working toward improving that performance. Equally important, the process, which in the lab was used to develop postage stamp–sized solar cells, appears to have the potential to be scaled up to develop larger cells for use in commercial applications. While there are still technical challenges to overcome, the process could eventually be adapted to use organic-inorganic hybrid materials for producing transistors, light-emitting diodes and other devices.